Last Friday we lost someone dear to us. All of us. Not just the people of the Star Trek community, but anyone who ever tried with varying success to make the Vulcan salute. Anyone who ever said “Live Long and Prosper,” whether or not they knew who brought that phrase into our cultural lexicon, and anyone who can understand the impact a positive public figure can have on the world. Leonard Nimoy was more than just a Star Trek icon—he was a cultural icon. His passing has been felt farther and wider than I think he could have possibly known, and I feel it's that humility, despite all of his skills, talents, and fame, that made him someone we all care about. 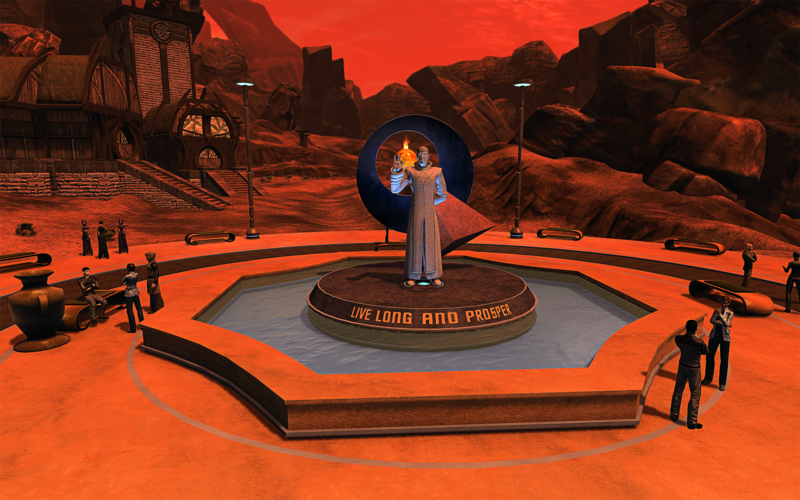 Based on where our community chose to congregate and pay their respects, we will be replacing the central structure on the fountain on Vulcan with a stone statue of Spock with the inscription “Live Long and Prosper." 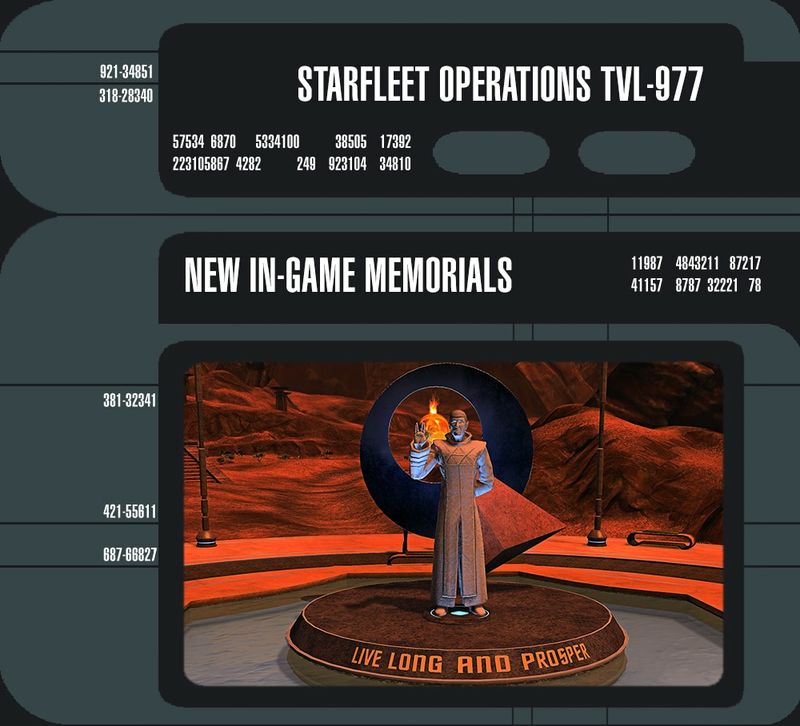 We will be adding the same statue to New Romulus with the inscription “The needs of the many outweigh the needs of the few”, as building toward Romulan and Vulcan reunification was one of Spock’s great life works. The Romulan Republic would not exist without his teachings. 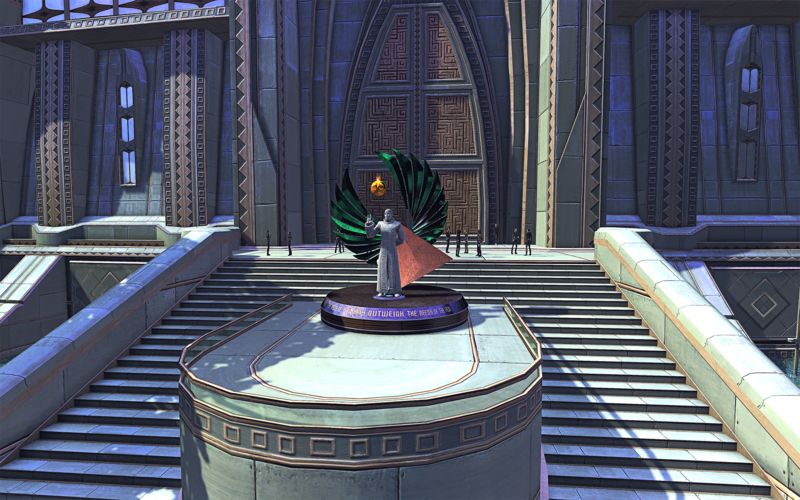 Through the next week we will also hang black flags of mourning in Earth Spacedock, Qo'noS, and New Romulus, so everyone that passes through those hubs will know we have lost someone important to us all. Finally, we will be adding a memorial plaque to those same locations for not only Leonard Nimoy, but for others in the Star Trek family who have passed. People will be able to interact with this memorial and read the names, the dates of their birth and passing, and a personal quote where possible. In this small way, we hope to honor the memory and contribution of those who helped shape Star Trek into the cultural touchstone it is today.